The Los Angeles Dodgers have spent at least $200 million on their payroll in every season since 2013. They’ll once again eclipse the mark in 2017. The team already has $187 million committed to just 11 players on their roster (along with seven players not currently on their roster, major league or otherwise), and that’s before nearing agreements with both Justin Turner and Kenley Jansen, for a total of nearly $150 million between the two. Hear #Dodgers Turner were close at 4 yrs, $64M, but could be higher total with deferrals to keep current value down. And here’s the thing – the Dodgers probably still need to spend more money to fill holes in their 2017 squad, even after taking care of third base and closer. Los Angeles still doesn’t really have a left fielder. Right now, they’re probably looking at a platoon of Andrew Toles and Trayce Thompson out there, depending on the health of Andre Ethier. They’re likely going to roll the dice once again with Yasiel Puig in right field, despite the trade rumors, injury concerns, and off the field issues that surrounded Puig in 2016. At second base? Well, Chase Utley got the bulk of the playing time last season, and while he could theoretically come back, the Dodgers probably wouldn’t want to hand the job over to him, given his struggles over the course of 2016. As currently constructed, their starting second baseman this year would probably be Kikē Hernandez. And then, the rotation. The only move Los Angeles made to bolster their starting give this winter was re-signing Rich Hill to a three-year deal. That’s fine – but every one of their starters has some degree of uncertainty surrounding their performance. Crossing your fingers and hoping that a rotation of Hill, Clayton Kershaw, Kenta Maeda, Julio Urias, and Scott Kazmir can give you 150 starts seems like a foolish proposition, even when you consider the low ceiling depth LA has in the vein of Carlos Frias, Brock Stewart, and Ross Stripling, or the injury-prone depth like Brandon McCarthy, Hyun-Jin Ryu, and Alex Wood. 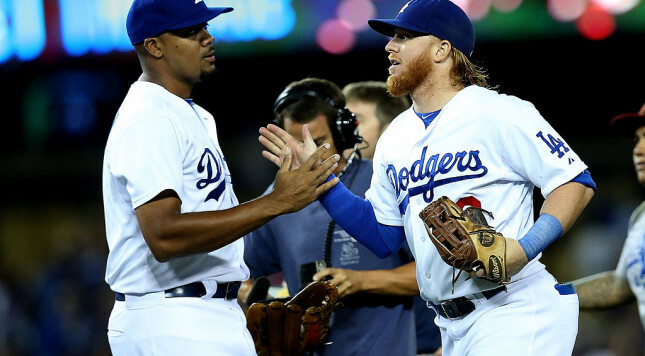 If there’s a bright side for the Dodgers, it’s this – they still play in the NL West. The Rockies, Diamondbacks, and Padres all finished at least a dozen games under .500 last season and don’t look close to contending in 2017. The Giants have had a quiet offseason, only signing closer Mark Melancon as a free agent, and still have holes in the back-end of their rotation, left field, much of the bullpen, and (arguably) third base. The “spending like drunken sailors” Dodgers will still be around in 2017, and they’ll still be around in 2018 too, with $146 million (before the Turner and Jansen contracts) already committed to that payroll. But like the rest of baseball’s large market teams, Los Angeles is clearing future payroll for the free agent class of 2018 – they’ll only have guaranteed money going to Kershaw, Hill, Maeda, Turner, and Jansen in 2019, with nearly all of their significant dead money falling off over the next two years. Just imagine a core of those five, along with reigning NL Rookie of the Year Corey Seager, and say…Bryce Harper patrolling an outfield position. When you put it that way…alright, maybe the Dodgers are still spending a ton of money, but at least they’re spending it properly.